Pictured is “Direct Conversations” by Olea Nova. This 2015 painting and other visual art will be featured in “Air,” her upcoming exhibit at the Evanston Art Center. To transform the invisible into the visible would be a miraculous achievement. Russian visual artist and composer Olea Nova hopes to accomplish just that in her upcoming exhibition “Air,” which features large-scale, abstract paintings. 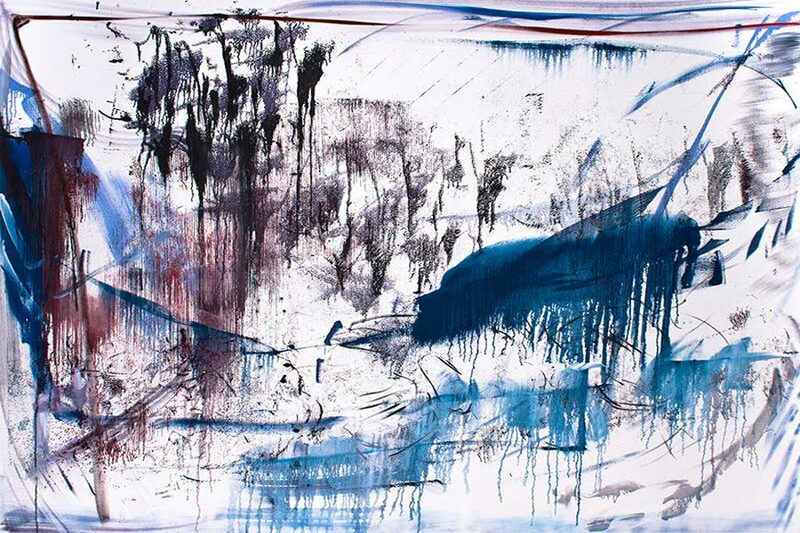 The Evanston Art Center will feature “Air,” a collection of works by Nova, from April 13 to May 24. Nova said she is interested in science and “invisible matter.” Through this exhibit, she hopes to describe space and the movement of air within it. Nova, who has lived in Chicago for 15 years, said she started working on the paintings for this exhibit in 2015. She said she typically starts with a drawing and then paints what she sketched. Nova applied to have her work showcased at the EAC and was later selected by the EAC’s exhibition committee. Cara Feeney, manager of exhibitions for the Evanston Art Center, said a committee member was “blown away” when they visited Nova’s studio in Chicago. “Seeing her work online doesn’t quite do her work justice because it’s these very large scale, abstract pieces,” Feeney said. Just as air is not confined, Nova is not limited to visual pieces in her artistry, as her exhibition will also feature music. She’s played piano since she was a child, and now, as a classical composer, she likes to layer her music with a lot of dissonance. While searching for contemporary sounds and new technology, Nova said that she stumbled upon the theremin, an electronic instrument that produces sound depending on the proximity of the hands to its two antennas. Nova will give a live sound performance, incorporating the theremin and synthesizers, to complement her exhibit on Sunday, May 19. In addition to the unique nature of the showcase, Feeney said the exhibition is timely because it will be presented during the center’s Spring Benefit Art Party, an annual event featuring an auction of Chicago area art. She added that it will be a nice backdrop for the gallery and create “beautiful walls,” serving as a welcome to spring. “It’s not necessarily subject matter, but she has these really bright beautiful colors that she’s working with that lift the grey of winter out of you,” Feeney said. That said, Nova added she did not create the art to invoke any specific feelings within the viewer.